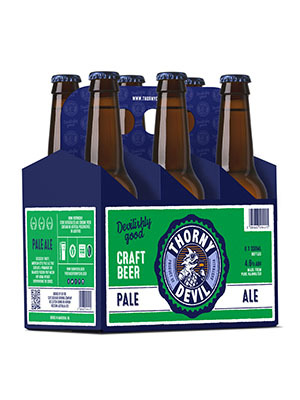 Beer Bottle Shop: Discounted Thorny Devil if you order now! A new bottle shop has opened at Portside Wharf in Queensland and it will offer customers a unique interactive brewing experience. The Sense of Taste concept incorporates education, demonstrations and tastings alongside boutique craft beers, small batch spirits and limited release wines. But perhaps what is most exciting about this new concept is that it comes complete with an in-store brewing station where people can meet local and international brewers and watch live brewing demonstrations. George Mellick, is not only the Area Manager for Star Liquor, the parent company behind Sense of Taste, but he is also a passionate home brewer and the driving force behind this unique, in-store experience. The setup includes a 30L Grainfather brewing system and they’ve also got a four-tap growler station. For the first live demonstration, Nick Wiseman from Grainfather and Mellick himself will be brewing an XPA. This will take place on the store’s Grand Opening party, which looks like it will be happening early August. “We decided that we wanted to do something where we’re adding quite a few hop additions, just so people can smell the smells and see a bit of action going on, rather than just sitting around a mash,” Mellick told Beer & Brewer. Beyond that, Mellick says that he’s already had dialogue with some local and international brewers who are all very keen to come in for a live demonstration. “I’m hoping that it appeals to beer lovers in general,” said Mellick. “Even just your mainstream lager drinkers can come in and be like ‘what’s going on there’ and we can be like ‘this is a brewing demo mate, we’re actually up to the mash stage here’.